If there is one thing we all should have noticed, it should be the lovely bond between Alexandre Lacazette and Pierre-Emerick Aubameyang. The duo have become best of friends in the Arsenal team. That they are actually meant to be rivals going by their positions in the squad makes their friendship more commendable. You wouldn't see that happen with some other players who see another as competitor. In training, they are cool together and when either scores, they are both happy. Their body language says it all and no one can debunk the fact that they are now a jolly pair. Lacazette after scoring two in the 5-1 game over Fulham before the commencement of the international break spoke on the partnership that exists between them. 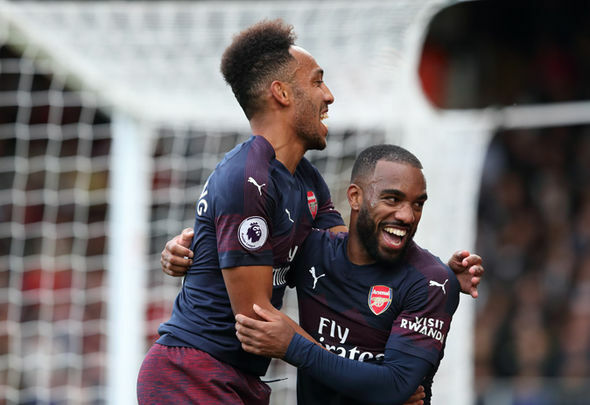 Auba who also had two goals to his name at Craven Cottage made a mark in the Arsenal team shortly after joining in the winter of 2017, posing a threat to the chances of Laca but today, they see one another as an inseparable lot. Their goal and assist contributions so far in the ongoing campaign have helped to shoot Arsenal to fourth position on the Premier League table, just two points from the top, and also raked in nine wins in their last nine in all competitions.